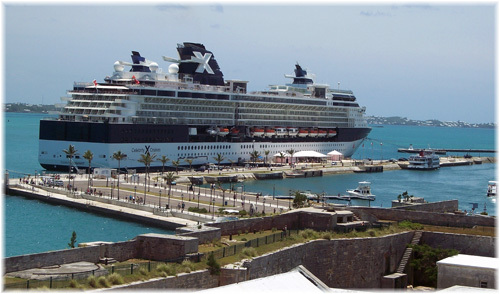 The Summit is a sister to the other very popular Millennium Class ships which have all been undergoing the process of being "Solsticized"
I had the pleasure of sailing on the Celebrity Summit in July to Bermuda. I left a very hot and humid Arkansas and found the days at sea refreshing and calm. Crossing to Bermuda is most unpredictable due to the weather and seas. I saw many patches and wrist bands but on this sailing certainly not needed. The Summit is a sister to the other very popular Millennium Class ships which have all been undergoing the process of being "Solsticized". She is due for her refurbishment and big reveal in January. Until then some of her softgoods are looking tired but they will all be replaced. The bones of the ship are good so I think that will be all she needs with the exception of the spa which in my opinion needs a more extensive redo. The strong point of the ship has to be the staff who are all friendly and helpful. Even the officers go out of their way to interact and are proactive at solving issues. The balcony cabin gets top marks for size and storage only losing points for a shower curtain that won't stay put and the floor to ceiling mirrors at the foot of the bed which made me not only cognizant of what I was wearing to watch TV but found me poofing my hair in bed, I think a first for me. I viewed an inside and oceanview as well and the baths and furniture are the same color and quality. The wood tones are light, contemporary and angular. Lighting and ventilation are good. The dockyards in Bermuda have been undergoing extensive renovations and in hindsight I wish I had allotted more time to the museum, perhaps picnicking on the grounds and enjoying the grand views and sea breeze. History buffs and boat enthusiasts would require much more time than the 2 hours I allotted. The ship was full and there were many multigenerational families. 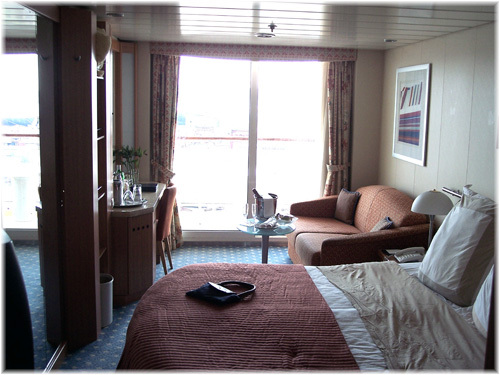 There were lots of kids and many of the 3rd and 4th berths seemed to be utilized. Judging from the accents many were from the NE drive market. There were many retired couples traveling as well. One of the couples at dinner reported that leaving from New Jersey was quite an advantage as he did not want to drive in NYC and the parking is less at $19 a day rather than $30. The port is closest to the Newark airport and that is the only airport where transfers are offered. The port is nothing like Brooklyn or any of the FL ports as the cruise ships are the exception in this cargo port. Embarkation and disembarkation was efficient if not luxurious. On such a full ship I find a balcony even more appreciated. Yesterday on a beautiful sunny day deck chairs around the pool were in short supply. Even now I sit on the sofa with the drapes fully open enjoying the sea view. I am impressed with the selection on TV after being on ships that encourage pay for view or have English as a minority, this was a pleasant surprise. Several movies that I would like to see are being shown in the small theater. Yesterday I attended 2 lectures, one a Smithsonian series and one on the history of Bermuda. The Captain is giving one now on the Navigation of the ship. Karaoke, scrap booking, friends of Bill and other standard activities abound as well. (If you don't see an option in the newsletter that you expect be sure and check the daily board in front of guest services) There is an impressive amount to do and the hard sell is pleasantly absent. Food ranges from average to excellent. The main dining room is attractive and from where I am sitting now on deck 5 mid there is a stunning aft view of the sea. At dinner the first night a table mate requested a made to order salad the remainder of the cruise and the next night it appeared on cue exactly as requested. Special requests are met with a simple "certainly" in the dining room as well as with my cabin. Shops are typical but not pushy. I even bought 2 items, very unusual for me. One was a new color of blush that looks perfect but is one I would not have considered until I had a makeover right in the cosmetic shop. I picked up several helpful hints in addition to the blush. Internet is satellite and as such is painfully slow; however the space, staff and equipment are excellent. The children's program from all accounts is a great success. I spoke with several tweens and teens and they all reported they were having a great time and when I asked what they liked best it varied from basketball to all the food to I just love to cruise. As an elite cruiser I had a few perks and one of them was high tea, certainly a special treat. Several passengers I spoke with are loyal to the brand due to the RCI loyalty program. There is one specialty restaurant and it draws inspiration from its namesake the Normandie, it is beautiful and elegant. The Escargot tortellini was PERFECT. If I spent more time cooking it is a recipe I would emulate. There is a full casino with all manner of games and I donated $1.55 to the cause but I observed many who were much more enthusiastic. I truly like that there is ample space and dedicated space to things such as the internet cafe, art auction and photo gallery. They were not an afterthought on this ship trying to share space with the card room or library. Shows are overall good with the guest entertainers being solid and the production shows solid as to ability but I found myself restless about half way through as I am not a Broadway show enthusiast. I think Celebrity hits the mark with the Summit. I would certainly recommend this ship and itinerary. For beach lovers this is a grand cruise as you can come and go as you want and utilize tours through the ship, public transportation or the readily available cabs. Many people rented scooters but this is not something I could recommend with the density of the traffic, driving on the left and the twisting roads. 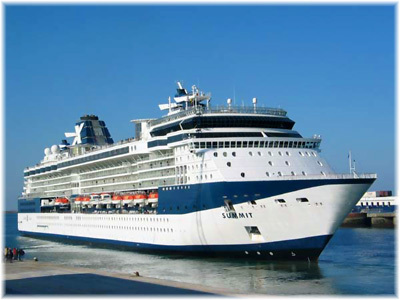 More images and info of the "Celebrity Summit"